Two sumo wrestlers walked into a bar. The brawl they had is rocking Japan’s sumo world. The case goes to the very heart of the clan-like sumo system, which already is reeling from accusations of bullying and match-fixing. TOKYO — The world of sumo has been turned upside down like, well, like a wrestler pushed from the ring. In a case that has enthralled Japan and dominated the headlines for a week, a 33-year-old grand sumo champion, a Mongolian called Harumafuji, is accused of assaulting a younger wrestler, a 27-year-old Mongolian called Takanoiwa, with items possibly including a beer bottle, an ice pick, an ashtray, a microphone and a karaoke remote control. Harumafuji, who holds the top rank of yokozuna, says he used only his bare hands, and a contentious investigation is now going on. Still, he’s expected to be forced out. 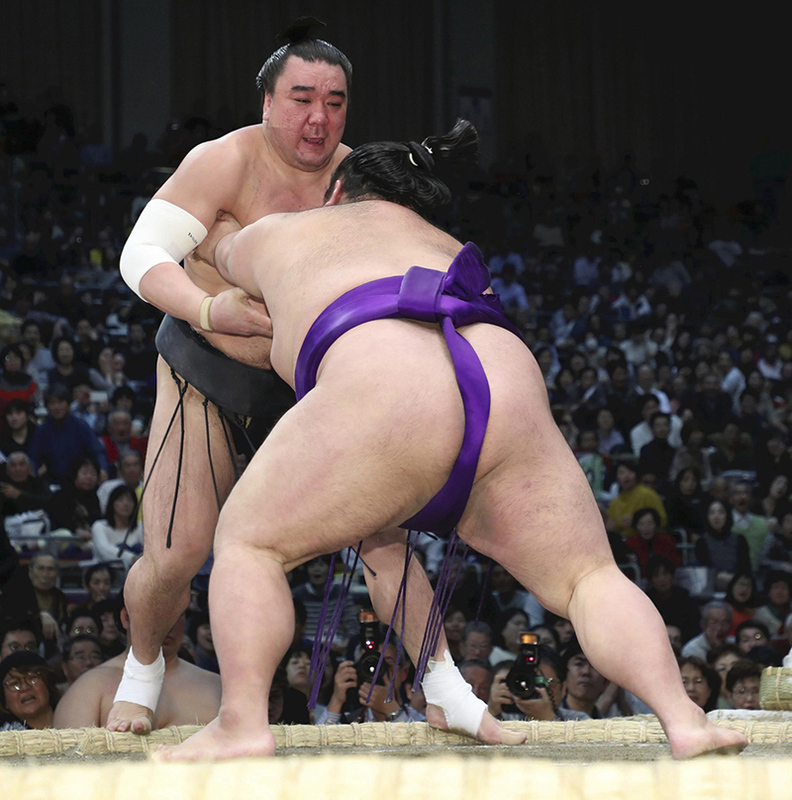 Sumo champion Harumafuji, left, shown in a recent match, is accused off assaulting a younger wrestler at a bar. Here’s how it started. The two Mongolians in question – Mongolians have become prominent in the sport in recent years – were at a bar in Tottori prefecture late last month. Hakuho, another yokozuna and, yes, another Mongolian, was lecturing the young Takanoiwa about his bad attitude, when the youngster picked up his cellphone and started playing with it, Nikkan Sports reported Monday. Others have reported that it was Harumafuji who was remonstrating with the errant junior. Takanoiwa’s original act of rebellion, according to reports, was telling the older wrestlers that they were over the hill. “Your era is over,” he’s said to have taunted. Things quickly took a turn for the worse. Enraged, Harumafuji picked up a beer bottle and began beating Takanoiwa on the head with it, according to local accounts. “Why are you doing that when the grand yokozuna is talking to you?” Harumafuji reportedly yelled. Another sumo wrestler said he heard that Harumafuji threatened Takanoiwa with an ice pick, but someone else said it was the younger wrestler who was wielding the ice pick. Other weapons used during the fracas reportedly included an ashtray, a microphone and a karaoke remote control. Hakuho said his fellow yokozuna hit the younger wrestler only with his hands, not with any other implements. Takanoiwa was taken to the hospital, concussed, and has a suspected skull fracture and a cerebrospinal fluid leak. He had to bow out of the Grand Sumo Tournament in Kyushu, which began on Nov. 12, and Harumafuji also withdrew, apologizing for the disruption caused by the incident. But this is where the story takes the twist that is causing ructions in the sumo world. The head of Takanoiwa’s stable – where wrestlers eat, sleep and train – didn’t keep the matter in the sumo world. Instead of reporting it to the Japan Sumo Association, he went to the police and filed a complaint. Then he waited two weeks to tell the sumo association he’d gone to the authorities, prompting accusations he’d been deliberately evasive. This is widely being seen as an attempt to undermine the sumo association, which was apparently livid at the stable master’s actions. The association has put a crisis management panel on the case. “We will put every effort into clarifying the facts as soon as possible. We will mobilize all our resources and implement measures to prevent this kind of incident from occurring,” Nobuyoshi Hakkaku, chairman of the Japan Sumo Association, said in a statement. The conservative Yomiuri Shimbun, Japan’s biggest newspaper, said that Harumafuji’s violence was “inexcusable” and below the dignity of a yokozuna, the grand champions who are held to the highest standards. “His primary duty to fulfill as a yokozuna is to act as a sparring partner for junior wrestlers in the sumo ring and display his strength, thereby inspiring them to work harder,” the paper wrote in an editorial. The incident comes just as sumo was recovering its popularity after years of waning ticket sales. The sumo association has to act quickly and resolutely to make sure new sumo enthusiasts don’t lost interest, the Yomiuri wrote. The whole incident speaks to a much broader problem in sumo, said John Gunning, a former amateur wrestler turned commentator. It shows the true nature of the sport, where wannabe wrestlers are often forced to endure tough, a “secretive and violent Darwinian world” where they are forced to sit all night in stress positions and clean toilets at 4 a.m., he wrote in the Japan Times. Compounding the problem was a lifetime of repetitive brain trauma which is causing the kind of concussions that are now being tackled in football, but which have yet to become a subject for discussion in sumo. Stay tuned, this case isn’t over yet.